A body of research has grown up around how gender inclusivity can improve peacebuilding and peacekeeping operations – and how gender-differentiated impacts drive both positive and negative foreign policy outcomes. We see this, for instance, in the correlations identified between rising bride prices and rising extremism, and between the prevalence of gender-based violence and a society’s likelihood of experiencing mass violence and atrocities. Given the prominence of concerns with extremism and mass violence in American foreign policy, these would seem to be key insights that would drive how U.S. policy is formulated at home, and how – and with whom – it is carried out around the world. They are not secondary, or forms of special-interest pleading, but rather a central aspect of how violence, brutality and instability come to hold sway. Sixteen years ago this month an effort to give this insight the force of international law and practice culminated in the United Nations Security Council’s unanimous adoption of Resolution 1325, asserting the importance of women’s “equal participation and full involvement in all efforts for the maintenance and promotion of peace and security, and the need to increase their role in decision-making with regard to conflict prevention and resolution.” Resolution 1325, for the U.S. and most other states, marked the largest national commitment to an agenda that began to emerge at the 1995 Beijing Fourth World Conference on Women. A community of researchers and advocates has developed under the banner of “women, peace and security” to delve deeper into the theory and practice of gender inclusivity. The term “gender mainstreaming” has become standard in the field to describe the practice of inclusivity not just in who makes policy, but in what policy is made, and how it is made. U.S. policymakers are theoretically committed to formal gender equality and convinced by inclusivity theory, but are completely unaware of – and resistant to – its gender theory parallels. New America’s Better Life Lab and New Models of Policy Change Project combined our experience in national security policy, gender theory, and cross-sectoral collaboration to look at whether and how inclusivity is shaping American national security policy. 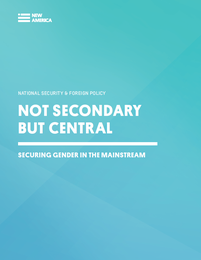 Our project, Not Secondary But Central, has partnered with the Center for a New American Security, the Chicago Council on Global Affairs, and the Texas National Security Network to carry out ground-breaking polling of the general public and elites on their views of the relationship between gender and national security policy. We commissioned POLITICO FOCUS for the in-depth interviews reported on here in order to gain a deeper understanding of how policymakers perceive the interrelated challenges and incentives they face. As the report here makes clear, U.S. policymakers are theoretically committed to formal gender equality and convinced by inclusivity theory, but are completely unaware of – and resistant to – its gender theory parallels. Scholars of conflict have identified several pathways through which gender differences at the societal level can have major, and often unanticipated, impacts on policies. Experiential studies have shown that postconflict agreements negotiated with women’s participation last longer than those negotiated by men alone. In development, for example, it is well-documented that schools without clean, safe restroom facilities will be less successful in convincing parents to enroll daughters – although restrooms might seem a minor consideration in areas where no schools currently exist. Some respondents understood implicitly that failing to understand how a given policy impacts different communities and identities has clear and negative implications for how American policy is formulated and conducted. But given that the vast majority did not, this report also contains perspectives that will concern those who care about effective, inclusive U.S. foreign policy as well as those who want to see a workplace where gender is not perceived as a barrier to success. Some respondents understood implicitly that failing to understand how a given policy impacts different communities and identities has clear and negative implications for how American policy is formulated and conducted. But the vast majority did not. We believe, however, that the report offers several reasons for optimism, and clear pointers for the road ahead. First, respondents saw concrete improvements in both the U.S. policymaking process and actual policy outcomes as women come to the table in greater numbers, and as gender concerns are named and prioritized more explicitly. Second, the central difficulties respondents identified – from lack of awareness of research that would support gender mainstreaming to resistance from members of the dominant culture – are familiar and well-studied in the research literature. We aren’t, in other words, confronting new and baffling problems, but ones which we can address and which are being addressed in other fields of American and global life. As gender mainstreaming is perceived less as special pleading from an advocacy community, and more as one aspect of smart 21st century decision-making strategy – and as more men and women enter the national security workforce conversant with the strategy – the attitudes described in this report could recede. The alternative, however, is that U.S. policymaking will continue to be by, for, and about the perspectives of less than half the world it targets, and the constituents to whom it is democratically responsible.